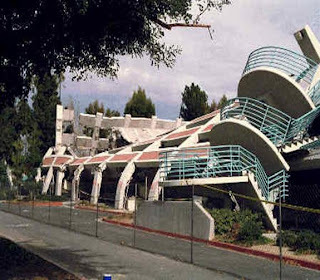 Today is the fourteenth anniversary of the Northridge Earthquake. The pictures in this post are all from places I knew well. One is parking structure at my university and another is of the Bullocks department store that used to be at the Northridge Mall. I saw Schindlerâ€™s List the night before the quake. I remember it well. I went with a friend who wasnâ€™t Jewish. We spent several hours after the movie talking about it. She wanted to know if I had lost family in the Holocaust and what my thoughts were. By the time I got home I was wired. I couldnâ€™t sleep so I sat up until the wee hours of the morning. Eventually I fell asleep, but not for all that long. 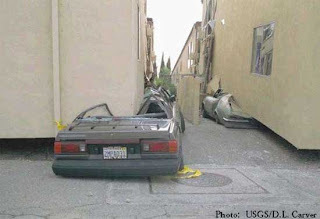 The quake hit just a short time after I had nodded off. I woke up to screams, violent shaking, car alarms and the sounds of breaking glass. When I stepped outside into the cool night air I saw a different Los Angeles. The power was out all throughout the city. The lack of city lights made the stars in the sky seem far more intense than normal. The whole thing took place in less than a minute. One moment the world was normal and the next it had changed dramatically. And that is all I have to say about this for now. It is hard to forget. Certain things still remind me of it. It reminds you just how small we are. I know a lot of people who had trouble sleeping after that one. I left a comment last night, but it’s not here…anyhoo…I will never forget that morning. Didn’t sleep well for a year after that…was always waiting for aftershocks. I will never forget that morning. It still haunts me to this day. It truly was an explosion than the shaking started. That last pic reminds me of the Cypress Structure during Loma Prieta. A friend of ours was in that and survived. He made it home, turned on the TV to a news broadcaster saying no one survived the flattening of that section of the highway, so he called the studio and told them his car was under it and he was home. Dan Rather interviewed him for a CBS report that aired the following night. Watching that is how I learned about our friend’s involvement. I never even felt a thing that afternoon. It freakily bypassed the area I was in.